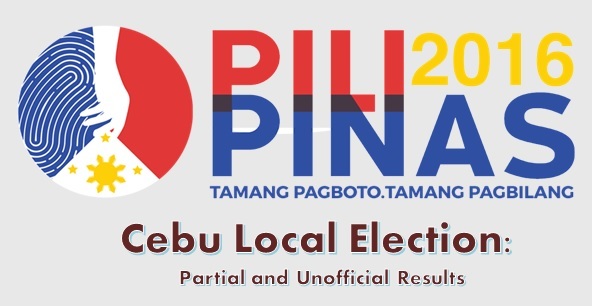 MANILA, Philippines - The Commission on Election (Comelec) announced partial and unofficial election results for Cebu local elections on Monday, May 9, after transmission of vote counts to the respective servers. The vote-rich province of Cebu comprise of more than 2,722,288 registered voters, a big chunk of 21% (11,316,789 voters in Visayas). Voters have selected candidates for all local positions: a town mayor, vice mayor and town councilors, as well as members of the Sangguniang Panlalawigan, the vice-governor, governor and representatives for the seven districts of Cebu including two districts of Cebu City and the lone district of Lapu-Lapu City. Incumbent Governor Hilario Davide III, who is running for a second term won the gubernatorial race against his opponent former Government Service Insurance System President Winston Garcia. The Provincial Board of Canvassers also proclaimed Agnes Magpale as duly reelected vice governor. Tomas Osmeña of the Liberal Party (LP) won Cebu City mayoralty race with 266,556 votes while his opponent Michael Rama of the United Nationalist Alliance (UNA) got 232,641 votes. UNA's Edgardo Labella was re-elected city vice mayor as he garnered 251,912 votes against LP's Nestor Archival who got 222,116 votes. The election 2016 results for Cebu is available on this page (live updates on widget below).